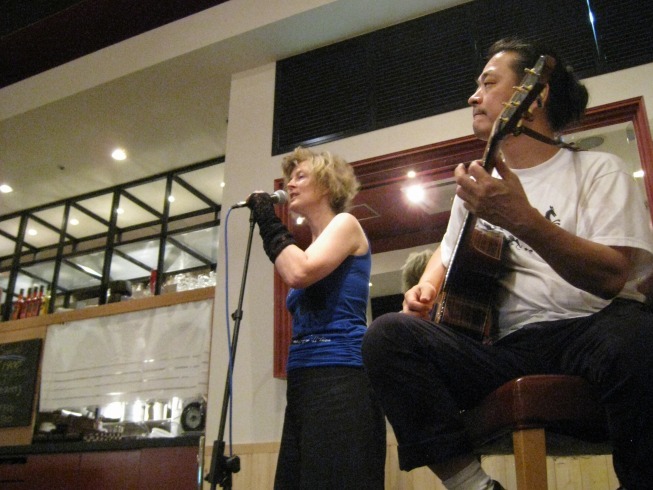 ﻿ Bix&Marki summer tour 2012："Bix&Marki original french pop jazz live concert INFO"
This third tour, starting in Nagoya, passing Kita Kyushu and up again to Matsue and Osaka,was at least as good as the other two. The temperature was an average of 34 degrees C, but we managed to walk and to take the train from one place to another, thanks to the warmheartedness of the many people who helped us to set up the concerts. We'd like to heartfully thank the cafe owners, the ones who helped us with the technical sound and light aspects, the ones who had made publicity for us and of course all the people who came to listen to us, despite the heat, and the ones who purchased our CDs. We started in Nagoya with two concerts, one at 3pm and one at 8pm, at DUFI. 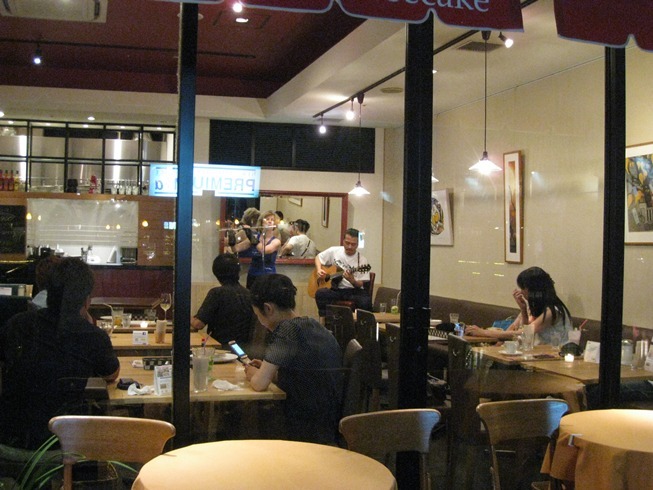 It was the second time we played there and we enjoyed again its relaxing mood and good food. The place is quite non-Japanese, one feels he can just be himself and talk with others. Happily, many of our friends came to see us, and we could also play and meet our new Nagoya friends. Knowing that we were going to play in an old "sento" in Ibaraki, I was filming while entering the live house where we played. What a surprise, we had to take off shoes and put on slippers, my camera was going from showers still fixed on the walls, mirrors, to bathtubs illuminated from underneath and old armchairs. It was a little dark, but just right to sense even more the reverberating sounds. Our friends' Misa and Yattchan's 6 voice-Acapella and our music seemed to sort of wrap the audience around in a towel after a bath. The 6 singers were great, with their Hawaian costumes (dresses sown by Misa) and Yattchan's voice-percussion. We were so happy that the new manager JUN liked so much Bix&Marki. We will definitely enjoy to come back to Ibarakiyu ! 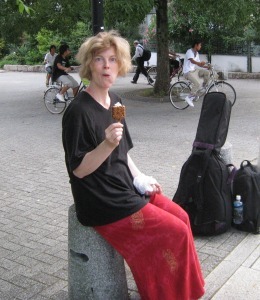 6 August 2012 (Mon) Bix first came to Kyoto about twenty years ago and at that time she was mainly painting and drawing. Charles from Papa Jon's Cafe, who had arrived in Kyoto 10 years before her, and was probably the first foreign national to have succeeded setting up a business there, happened to see her paintings and bought some for his coffee shop! Now he has got 4 coffee shops in Kyoto and her paintings are still there and even printed on the bags. Papa Jon's menu is excellent, its speciality is a New York style-cheese cake. He very kindly gave us a delicious dinner and drinks after the concert. It seemed that he had not had cultural events in his Cafes before, and this was the second opportunity for him to see how an event could fit in. The first one was 3 months ago, a story-telling event in English, which will take place once a month. Maybe this is a new Kyoto Connection, who knows, Japanese and foreign artists have so much to share with each other and the public. We thank everyone who came to see us, and Charles and his wife and all the staff at Papa Jon's for this concert. 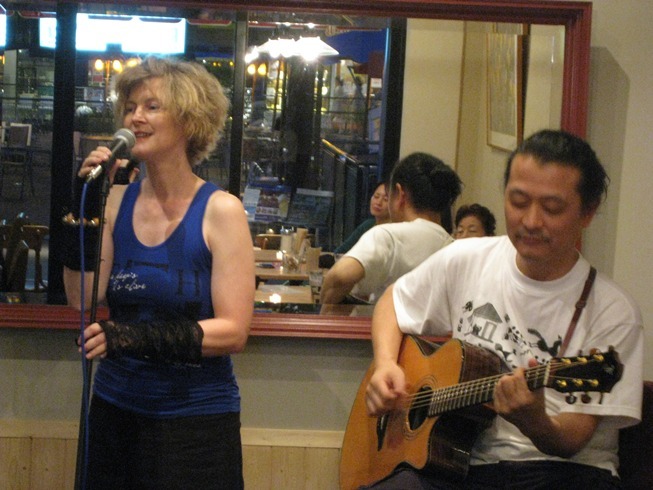 We played as we did in Spring and last Summer in the lobby of the Ferry Boat between Osaka and Kita Kyushu. People of all ages listened to us, families with children, sport teams, traveling workers, we usually don't have such a variety of audience ! Some listened to us for the whole hour, like this musician whom we took a beer with after the concert and talked with about music and life. The good thing about this tour is that we get to know so nice and interesting people around. In exchange of the concert, we could sleep very well in a first class cabin and have a wonderful dinner, which was great. We were happy when the officer in charge of the information desk said 'see you soon again'. When we arrived in Kita-Kyushu, we took the shuttle bus to Moji, which we now know well. We watched the beautiful nature, the shape of the mountains and the sea while arriving to Brick Hall where we were to play a lunchtime concert. The old European brick house was as charming as last time, and we did have a wonderful time playing on the wooden stage, for not so many - but still very nice and friendly - people. Someone who had seen us before came by during his lunch break, and we talked with the audience after the concert. Brick Hall usually doesn't do lunchtime concerts, but because we had to go to Yamaguchi the same evening, the owner Mr S was so kind to organize it for us. 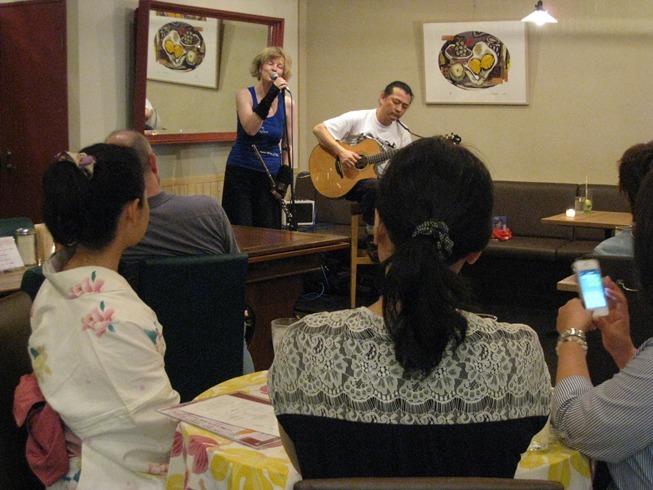 In Hiroshima, we played like we did last year “Live at Nagahama” in Mr. Nagahama's Japanese style Izakaya. Mr. Nagahama was there and put the audience at ease, he and Ms Abe had kindly invited their clients for a Bix&Marki dinner show. An English student of Bix in Tokyo, who was a 1 year-old A-bomb victim in 1945 in Hiroshima came to see us, after she had participated in the Hiroshima Peace Memorial Ceremony. We enjoyed again the warmth of the people from Hiroshima, a very good response to our music, and the wonderfulsashimi prepared for us. What a good place to eat and drink. A big thanks to Mr. Nagahama and Ms. Abe and to all the people who came to see us. 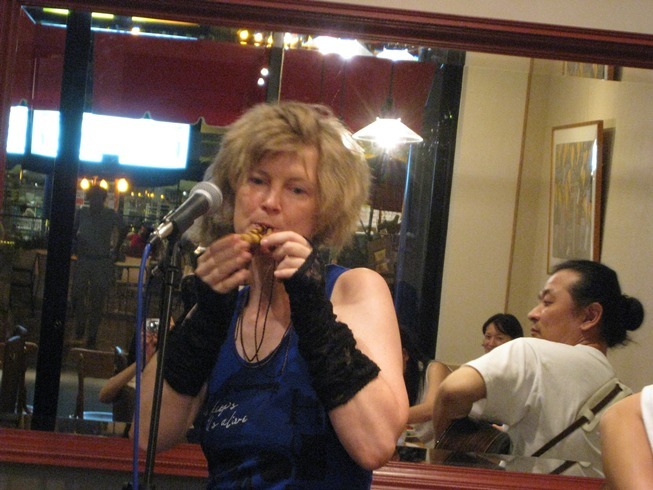 In Kurashiki we played in Penny Lane, a place run by the pianist Ms N. who is well acquainted with musicians and the world of art. We arrived in the afternoon and she told us about the Ohara Art museum and the old town, about 10 min walk from there. We decided to go and see them before rehearsing. The old town was beautiful, almost deserted in the heat, and the museum had a great collection of classic, impressionist and abstract expressionist works….. The temporary exhibition of contemporary Japanese art was amazing, the chosen works so good. It was a rich day for us. 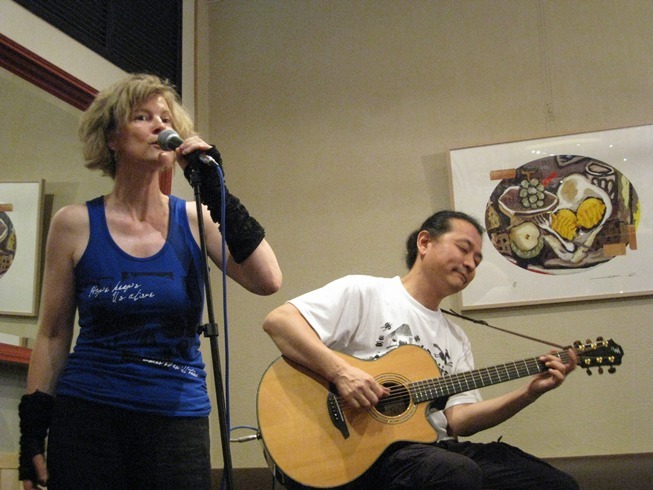 The concert went very well, although few people came because we didn't know anyone in Kurashiki. People from the street came in to listen to us, and we got a good contact with everyone. We had decided to visit Matsue in Shimane this Summer because our friends who had come back from Belgium, Nozomi and Takeshi had told us please to come by. So we did. After Okayama and before Kyoto, we came to Matsue and enjoyed the beautiful Kenritsu Museum, Lafcadio Hearn memorial house and castle of Matsue, also the good soba and the sunset on the lake. We played in Tete de Bavard, which we can say is a wonderful European Underground Style Art Cafe. The owner Papa had made it by himself 12 years ago and organizes concerts mainly for musicians who play original songs. That was the special thing about it : Papa's taste in the design, wooden ceilings, comfortable old sofas to sit in, and good food went so well together with an audience who was prepared to listen to never heard-before songs and who listened to us in deep silence. A wonderful evening, a wonderful place, and wonderful people, thank you Papa, Nozomi and Takeshi. 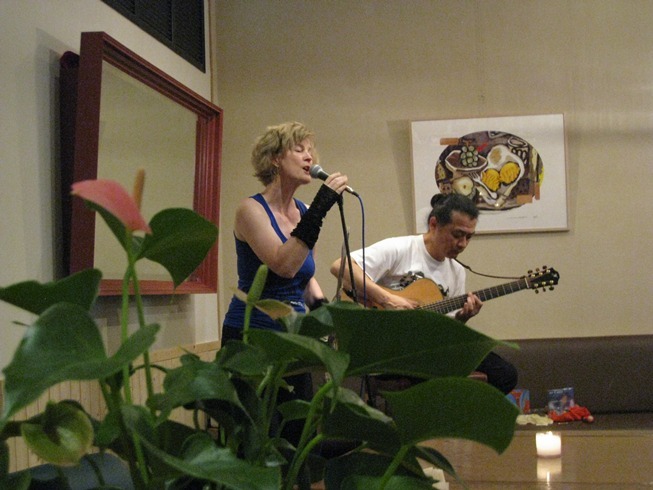 It was a great musical evening at Layla in Kameoka. 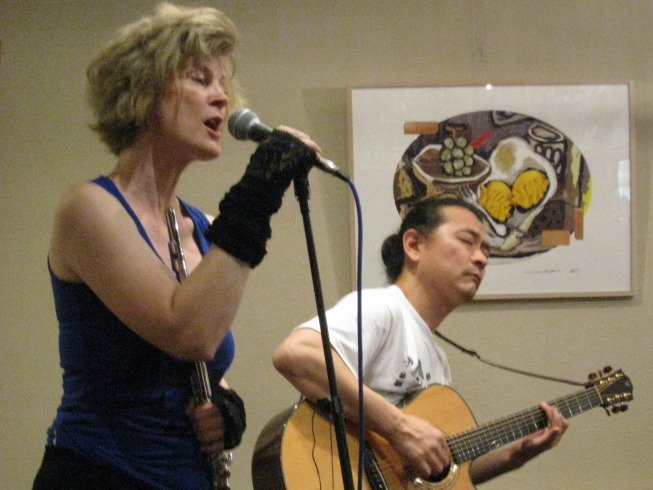 We played our songs, and we played 3 songs with flute and sax player Kuri san. 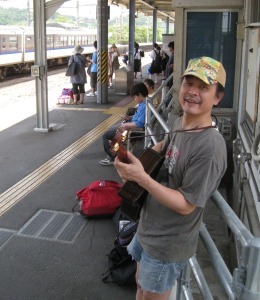 He is actually a guitar player too, and has a used guitar-shop on the national road nr 9 in Kameoka. Layla's Master sang two songs too. It ended with a nice jam session. The sound was wonderful and we enjoyed the stage surrounded by many instruments and music lovers (the audience). Marki had visited the place half a year ago and the Master had asked if we could play at Layla this Summer. We didn't regret it and will be back. Un shu Do, in Osaka, our last concert of this tour. We arrived there quite early and were amazed by the beautiful interior of this huge old Machiya (Japanese wooden city house). The stage was high above the seats and tables, and so was the ceiling. We played with two other bands 30 minutes each, first Mama trio, then us and the third one soul-solo singer Asuka. All three groups were playing mostly original soft acoustic music which seemed to give a certain musical unity to the audience. They listened to us carefully, and we got a very nice response and contact. The day before, we had written name plates for our parents who passed away this year to be burnt on the Daimonji mountain this same evening, on the 16th. We both had a strong feeling for them just after 8 pm when we started playing, knowing that the plates were starting to burn then.